This elusive little fern is a rare sight in this area, unlike its common cousin, western sword fern. I’ve been looking for it for a while and was delighted to spot it recently, growing in a canyon among many other species of ferns. California sword fern (Polystichum californicum) has leaflets that are deeply serrated but not cleft all the way to the midvein. 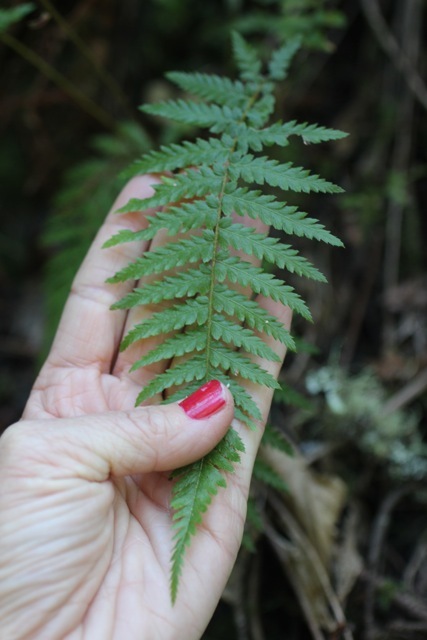 The leaves have a slightly leathery, tough feel to the touch when compared with more frail wood ferns, lady ferns, bracken ferns, and the like. They also lack the prominent thumb or hilt that points dramatically towards the tip of some other sword ferns (though the upper lobe closest to the central stem is somewhat enlarged). California sword ferns are endemic to California, and grow in the shade of deep canyons, as well as wet places near cascades and streams, according to the Marin Flora. The plant photographed here was seen along the Steep Ravine trail on Mt. Tamalpais. For many years I didn’t know that there were other species of sword fern other than the abundant and lovely western sword fern. But there actually are four species in the Bay Area. In addition to California sword fern, the others are: western sword fern, whose leaves are only very slightly serrated; its smaller but quite similar cousin, rock sword fern; and Dudley’s sword fern, which resembles California sword fern but has pinnae that are so deeply serrate that they become separate leaflets–or fully tripinnate–at the base (or, as the key puts it, “pinnae pinnate; pinnules stalked”). 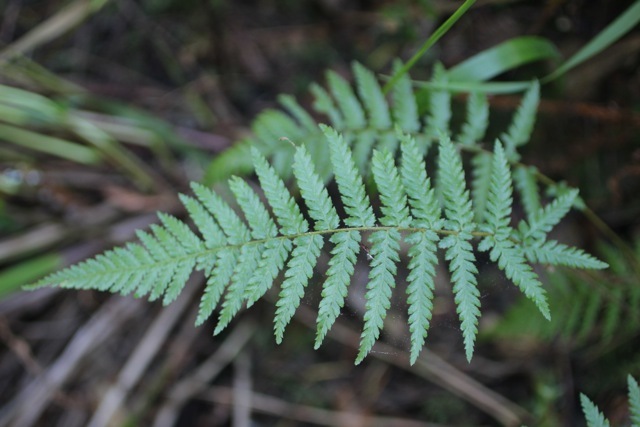 According to the key, California sword fern is a species resulting from an original hybridization between western sword fern and Dudley’s sword fern.